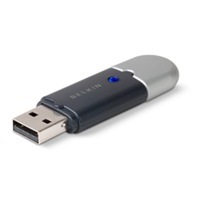 Now you can add Bluetooth wireless capabilities to your USB desktop or notebook computer.The Adapter uses advanced technologies - Bluetooth standard v2.0 +EDR and USB 2.0 - to provide you with quicker connection times, enhanced voice and multimedia quality, greater Wi-Fi environments, and up to three-times-faster data-transfer speeds. The new driver includes support of the Voice over IP profile, enabling you to seamlessly call over the Internet. • Allows you to work at distances of up to 10 metres (Class 2).